Max Teplitski - Max Teplitski, Ph.D.
Like every 19-year old, Max Teplitski was looking for new experiences. He found them when he left his homeland of Ukraine and came to Auburn University to study Agronomy. His mother was a professor of applied and theoretical mechanics and his father was a miner. Having grown up around all things technical in a mining community of a Ukrainian rustbelt, Max learned to appreciate the complexity and fragility of biological systems. 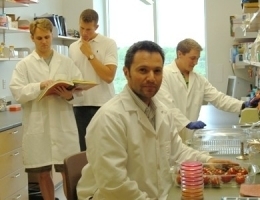 Dr. Teplitski credits his Ph.D. and post-doctoral advisers, Drs. Dietz Bauer (now at UC Davis) and Brian Ahmer for fostering his interest in plant-bacterial interactions and Salmonella genetics. CPS student staffer Alyson A. Barnes spoke with Dr. Teplitski recently about his career path and research. First off, you are now at the University of Florida. What brought you here? How did you learn about the Center for Produce Safety? Through several sources, including colleagues and deans at the University of Florida’s Institute of Food and Agricultural Sciences. CPS awarded your project “Reducing tomato contamination with Salmonella through cultivar selection and maturity at harvest.” Can you tell me a bit about the project? We are screening tomato genotypes and existing commercial tomato varieties for their susceptibility to Salmonella. The goal of this preliminary screen is to test whether we can find evidence of “resistance” to Salmonella in the already existing commercial cultivars. The identification of such a cultivar will be a cost effective solution for reducing incidents of tomato contamination with Salmonella. This is a small exploratory project funded for a year; within this year we plan to efficiently complete the screen of some of the most popular commercial tomato varieties. So far we have tested approximately a dozen cultivars. In the field we found two cultivars that are much less conducive to Salmonella growth. Those two are now being re-tested in a greenhosue before we make any further conclusions. Have you uncovered anything interesting/surprising thus far into the project? Interesting -- yes! Not all tomato cultivars are susceptible to Salmonella contamination to the same extent. Our preliminary results indicate that upon completion of this project, we will have a list of existing commercial tomato varieties that appear to be more or less susceptible to Salmonella contamination. This is exciting, and parallels the data from Jeri Barak’s and Keith Warriner’s groups that demonstrated different strains of Salmonella interact differently with different crop varieties. Where do you see the field of food safety research five years down the road? I think we will have more focus on a reasonable solution and a comprehensive set of practices for promoting food safety. Consumers will have to come to terms with the fact that at least some of the nutritional benefits of raw foods are due to the microorganisms that reside within raw foods. In some (very rare) instances raw foods may harbor pathogens. Once consumers are comfortable with this realization, we can move toward a comprehensive approach to food safety. This will include reasonable adjustments in pre- and post-harvest practices (e.g., cultivar selection, optimization of the fertilization and irrigation regimes to discourage plant pathogens), consumer education and marketing campaigns. What would you say a days work consists of? I teach several classes on microbial ecology and the ecology of waterborne pathogens to undergraduate and graduate students. I spend the rest of the day in the lab working with graduate and undergraduate students and junior faculty members. I have also developed and facilitated workshops on pathogen ecology in Gainesville; we are taking the workshops to India for five days this summer to share our knowledge of microbial ecology and waterborne pathogens and also to gain a perspective on this problem from another part of the world, where the situation with water- and foodborne pathogens is catastrophic. How do you spend your time outside of the lab? I have a small farm outside of Gainesville, with vegetables, poultry and a pasture with a few cows. This is where I get a lot of inspiration and also samples for the hypotheses that we then test in the lab. Conversations with my neighbors at the Seed and Feed store help me stay grounded and focused on what’s really important to farmers and rural citizens. Science and farming are very time consuming hobbies, but I wouldn’t trade them for the world. Lastly, what would you consider a career highlight? Helping the next generation of scientists flourish is the greatest footprint I’ll leave. Watching them succeed along the way makes my every day. A funny story: for my birthday a few weeks ago, our research team members gave me a card where they wrote, "Your gray hairs are our present to you." The fact that I keep earning my gray hairs the right way is my biggest pride.